Telangana Police Sub Inspector (SI) Written Exam Hall Ticket Download 2019 from 15th April 2019 to 18th April 2019 from tslprb.in website. Telangana Police Sub Inspector Written Examination Halltickets download from 15th April 2019 at 8.00 AM to 18th April 2019 at 11.59PM. Examinations conducting on 20th, 21st, 27th April 2019. SI Civil examinations conducting in 20th and 21st April 2019. SI (IT, Communications) Fingerprint bureau written tests conducting on 20th and 27th April 2019. 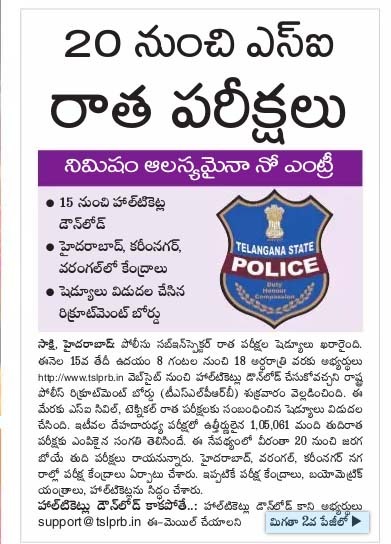 The candidates can download their Telangana Police Sub Inspector (SI) Written Exam Hall Ticket Download 2019 from 15th April 2019 to 18th April 2019 from tslprb.in website.